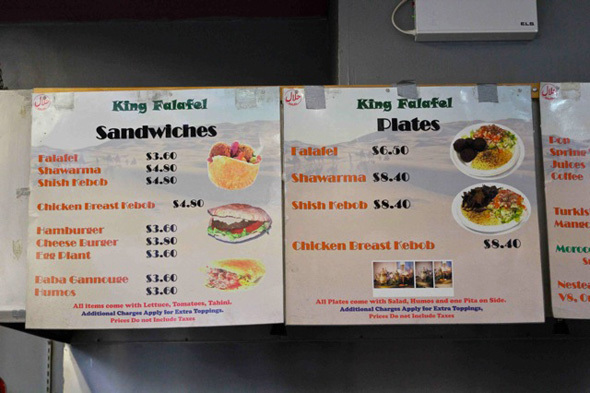 King Falafel packs big taste into a perfect little pita. 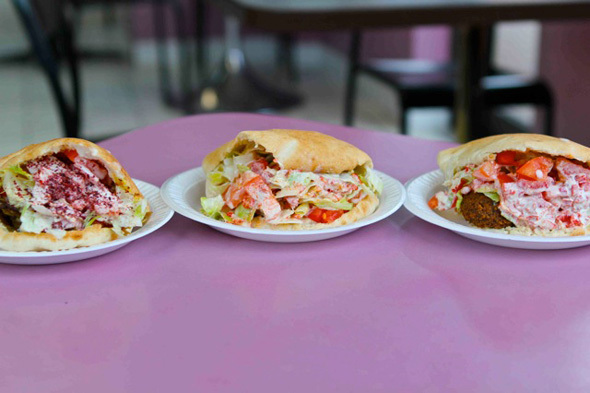 A precious gem modestly nestled at the southwest corner of Bathurst and Eglinton , the Moroccan owned establishment has been dishing out affordable and delicious Middle Eastern fare for nearly 20 years. While the restaurant's façade isn't exactly a treat for the eyes, inside, the tantalizing aromas of roasted shawarma and fresh pita will instantly activate you salivary glands like one of Pavlov's dogs. The key to the King is simplicity and consistency. Some will praise other pita parlors for their myriad toppings, but a no strings and no surprises mantra can speak volumes. Adorning each warm, plentifully packed pita, is a base of homemade hummus, the protein of your choosing, and a cap of fresh chopped lettuce, diced tomato, tangy tahini and fiery Moroccan-style hot sauce. We started our meal with a trio of sandwiches, all served in a warm chewy pita pocket. The light, crisp exterior of the made to order falafel is perfectly balanced by the soft, warm interior. Each bite melts in your mouth and tempts you to take another before you manage to swallow. The chicken breast kebob ($3.60) flavorful and somewhat smoky from its time on the grill, however I wouldn't have been upset with a little more substance in the meat department. 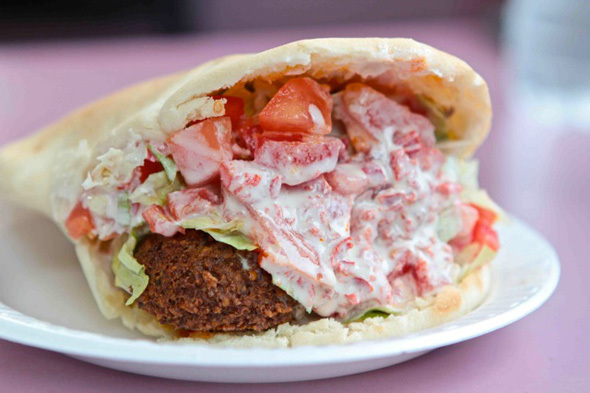 Despite the deliciousness of the falafel, the beef shawarma ($4.80) will always be the ace that bests the king. In my opinion, one of the tastiest and most classic shawarmas in the city. The meat has a delightful flame licked texture, almost like the sear on a well-prepared steak, and the Moroccan spices coupled with subtle curry notes take it over the top. 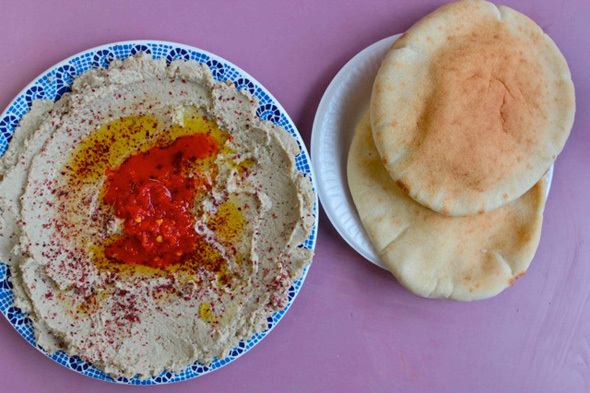 Call it gluttony, but we dove into a plate of handmade baba ghanoush ($3.75), following our assortment of sammys. Velvety smooth and almost akin to an eggplant derived hummus, it didn't blow me away. Yet, I did appreciate that the scent of garlic wasn't immediately protruding from my pores. 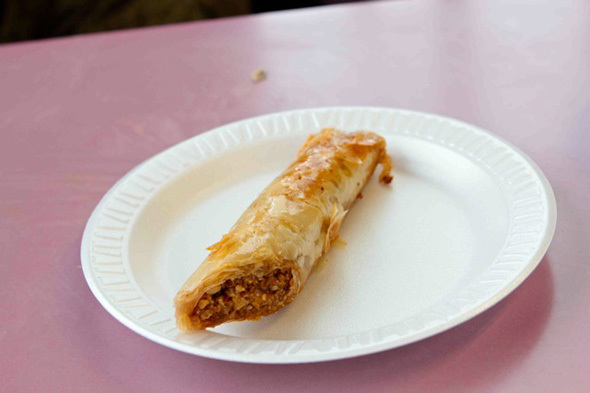 Then there was the baklava ($1.99). I'm not a man with a sweet tooth, but this is one flaky, chewy, honey laden, almond infused, log of legendary quality. Don't leave without trying one! Five well prepared items, two drinks and a sub $25.00 tally that counts a tip for the friendly staff — well, that pretty much speaks for itself. Writing by Jason Finestone. Photos by Abigail Ainsworth.